Chelsea Martin, US travel advisor and lifestyle influencer, visited Mexico’s Pacific Treasure and shared her experiences on her Instagram account. There’s a growing number of millennials who are identifying as influencers as well as Virtuoso travel agents; these are the men and women who are setting trends and moving the luxury market for this generation. One of these top influencers is 20-year-old Chelsea Martin, who recently toured Mexico’s Pacific Treasure by invitation of the Riviera Nayarit Convention and Visitors Bureau (CVB) so she could experience the destination firsthand. During her stay in in Mexico’s Pacific Treasure Chelsea Martin had the chance to visit the destination’s four Virtuoso Preferred properties: Grand Velas Riviera Nayarit, a AAA Five-Diamond all-inclusive property; Imanta Resorts Punta de Mita, a Relais & Chateaux property; and The St. Regis Punta Mita Resort, another AAA Five Diamond hotel. The Public Relations office of the Riviera Nayarit CVB prepared a very complete itinerary for her so she could experience the most iconic spots in the region, among them, the Mercado del Mar, located in La Cruz de Huanacaxtle; Sayulita Pueblo Mágico; La Patrona Polo & Equestrian Club in San Pancho; and, of course, the Islas Marietas National Park. A special visit to the W Punta de Mita and its magnificent Wixárica culture-inspired design was also a must. The travel consultant was accompanied by her mom, Theresa Martin, who is also a Virtuoso travel agent in San Diego with a focus on empty nester parents: couples whose children are out of the house, giving them plenty of time to travel. 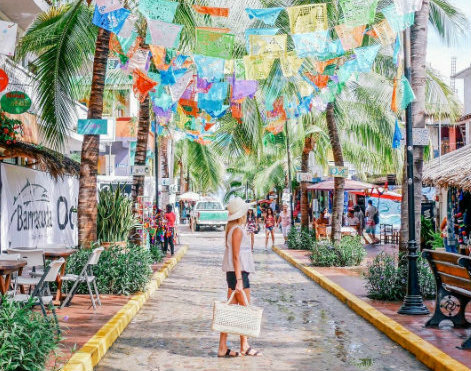 Theresa has her own travel blog, Empty Nest Traveller, where she already published an article titled “7 Reasons You Need to Visit Riviera Nayarit Now,” highlighting the safety of the area, its tranquil beaches, its luxurious hotels and its amazing cuisine. The promotional work done by the Riviera Nayarit Convention and Visitors Bureau (CVB) is maximized with visits like those of Chelsea Martin, which take advantage of the extensive market penetration these social media platforms have in the era of millennials, thus diversifying markets in different latitudes.